Here are my examples and code for my Bay Area Maker Faire 2017. Presentation itself to come later. Before running the Frequency Hopping Example, you'll need to download, unpack, build, and install the out of tree module for the "frequency hopper sequence generator" (last link above) to build the new block. I gave the opening talk at the SDR dev room at FOSDEM again this year. There will be video posted on the FOSDEM website at some point, but I have also added my material here. Exploring the concept of extra currents. Viewing the currents in the frequency domain. 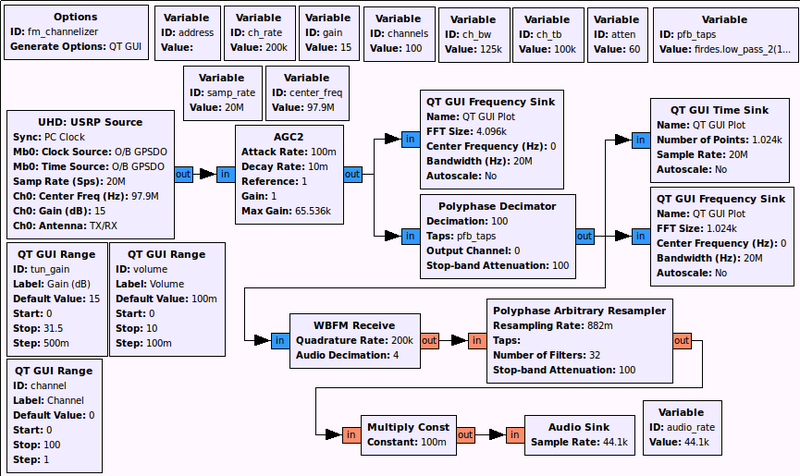 Generating an impulse as a wideband signal source. 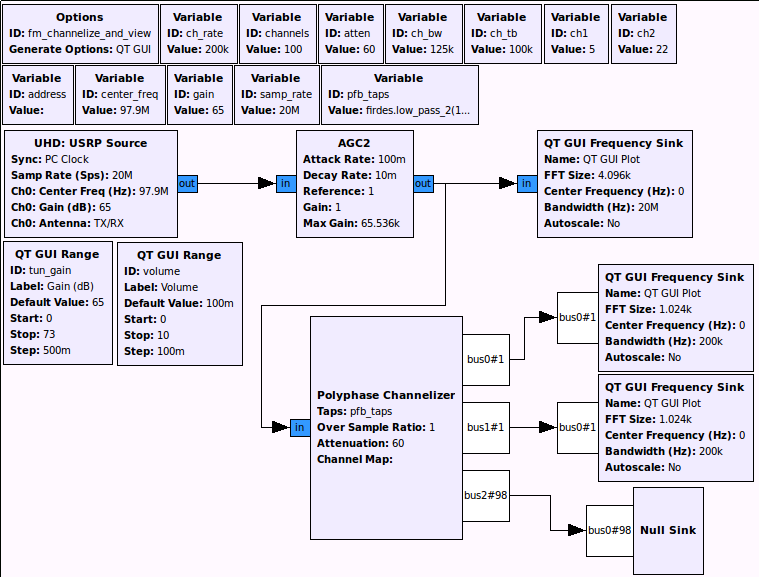 Creating a receiving filter to mimic tuning an antenna. The talk ended with me showing the ability to capture the transmitted signal on a Nexus 7 running a GNU Radio Android app with an RTL-SDR dongle. The Android branch of GNU Radio and a HOWTO will be made available soon. These PDF files are my presentations for the UCLA SDR class. 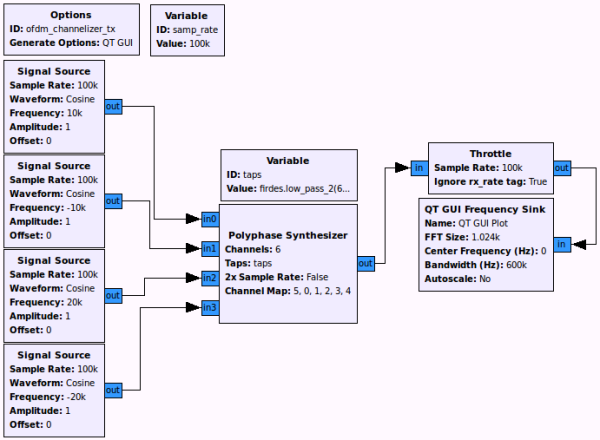 Each PDF has accompanying scripts for GNU Radio or a few simulations based in Python. Many of the Python scripts and GNU Radio examples will require Python plug-ins Numpy, Scipy, and Matplotlib, all of which are easy to find and install. For some of the more advanced examples, I had to create my own blocks. 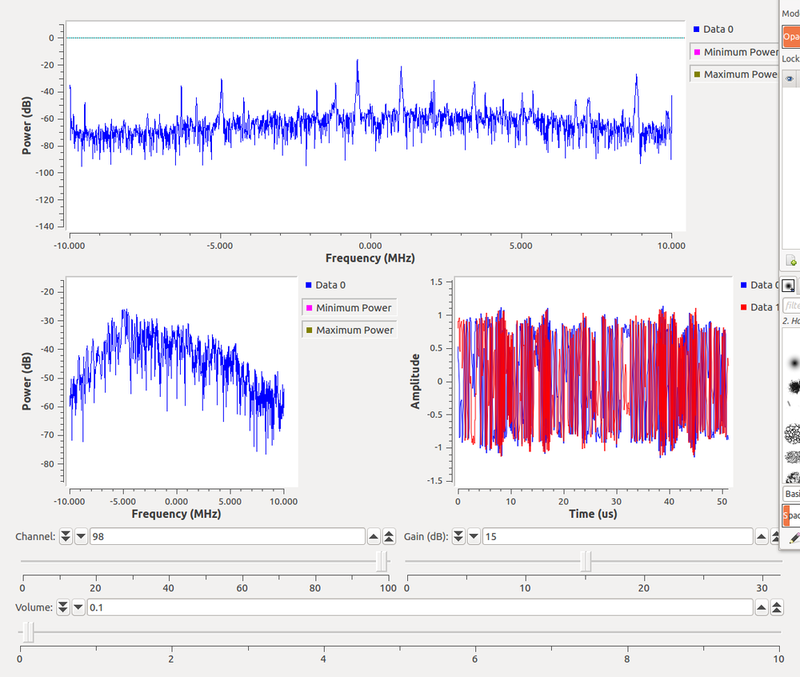 These blocks include a very simple signal classification engine to distinguish between BPSK and QPSK and another very simple energy detector. These are, basically, too simple to properly distribute or put into a actual project. Instead, you can just download and install the OOT project here called gr-mymod. You'll need to build and install this as an OOT GNU Radio module. GNU Radio provides a couple of GUI interfaces using wxPython or QT. This example focuses just on the QT interface, gr-qtgui. Through a few small tweaks to an existing program, we can start to add QT sinks to the flow graph to start to visualize different signals, which can be especially useful when debugging and analyzing signals. The QT framework allows us to go even farther, though, and build entire applications in QT (using PyQT, for example). Also, the QT sink is written in C++ and wrapped into Python with SWIG, and so it should be possible to build C++-only applications using QT, although this hasn't been tested, yet. In this example, though, we're just going to focus on inserting a QT sink into an existing flow graph to provide the basics of what is required to get a working GUI. We'll start with a simple application that adds two sine waves together with some additive Gaussian noise and outputs to a sink (I'm using a null sink here because we really don't care about the output until we add the GUI). Obviously, to access this information, we need to import QtGui and sys into the Python project. In the end, there are a few new modules we have to add. We'll get to those later. In this constructor, we can specify the size of the FFT points (e.g., 1024, 2048, etc. ), the window type, which we can get from gr.firdes, and the center frequency and bandwidth to set up the axis. The "name" parameters is the title of the window that will appear in the title bar of the display. The next five arguments are all Boolean values that default to True and are used to determine whether or not to display a particular type of plot. The types of plots, in order, are the FFT, waterfall (spectrogram), 3D waterfall, time, and constellation plots. The final parameter is an optional parent, which defaults to None. When working a QT sink into a larger QT project, you can pass the parent information in this way. Ok, so now we have a way to create a QT sink object. It acts like any other GNU Radio sink as far as the flow graph is concerned. We just connect a signal to it. Unfortunately, there's a bit of ugliness left to work through in order to expose the QT GUI -- we have to tell it to show itself. This is done by getting a QWidget instance of the object in Python and calling the show() function on this. Putting all of this knowledge together leads to the code below (which you can download here: qt_basics.py). There are a few new lines that I will explain afterwards. Now, instead of just importing the gr namespace, lines 3-5 import the GNU Radio qtgui module, QtGui from PyQT, and sys and sip. In line 11, we get our reference to the qApp, which takes in a set of arguments that we get from sys.argv. We tend to ignore this, though, although advanced users can manipulate the system through this interface. Lines 18 - 21 call the qtgui constructor for a complex sink (sink_c). Following the prototype above, we create a sink where the FFT size is initially 2048, we use a Blackman-harris window, set the center frequency to 0, and the bandwidth is just 1. We then give the window a title, "Complex Signal Example," and turn on the FFT, waterfall, and time plots. The final change required is to call the qApp's executor function. This is a blocking loop, so we can first start the flow graph as a non-blocking call with mytb.start(). Instead of calling mytb.wait() like we originally did, we now let the QT framework lifecycle take over in line 32 with mytb.qapp.exec_(). Make sure to call mytb.stop() to properly shut down the flow graph and delete the objects in the proper order. When you run this program, you will see a display that looks like the following. The display starts by showing the Frequency plot (if it's activated, of course). The next tab shows the waterfall display (or spectrogram) that starts at the bottom of the screen and moves up. This image was captured after a few seconds had passed. I also hit the "Auto Scale" button in order to set the dynamic range of the color bar to best represent the range of the signal (in this case from 0 dB to about -64 dB). The last tab in this case shows us the time waveform, showing a trace for both the real and imaginary parts of the signal. Notice that the display has a few different controls. For one, while we set the initial FFT size to 2048, this can be changed in real-time by clicking the "FFT Size" drop-down box and selecting from a handful of preset sizes (all powers of 2). This will adjust the resolution in the frequency and waterfall plots and will increase the number of samples displayed in the time domain plot. We can also tell the display to show the frequency domain relative to the RF frequencies. This check box really just uses the fc argument we passed to the constructor to reset the x-axis of the frequency and waterfall plots. Another drop-down box exposed for us to change in the FFT window. While we initialized with the Blackman-harris window, this gives us the option of whatever windows are available in GNU Radio, which currently includes Hamming, Hann, Blackman, rectangular, Kaiser, and Blackman-harris. 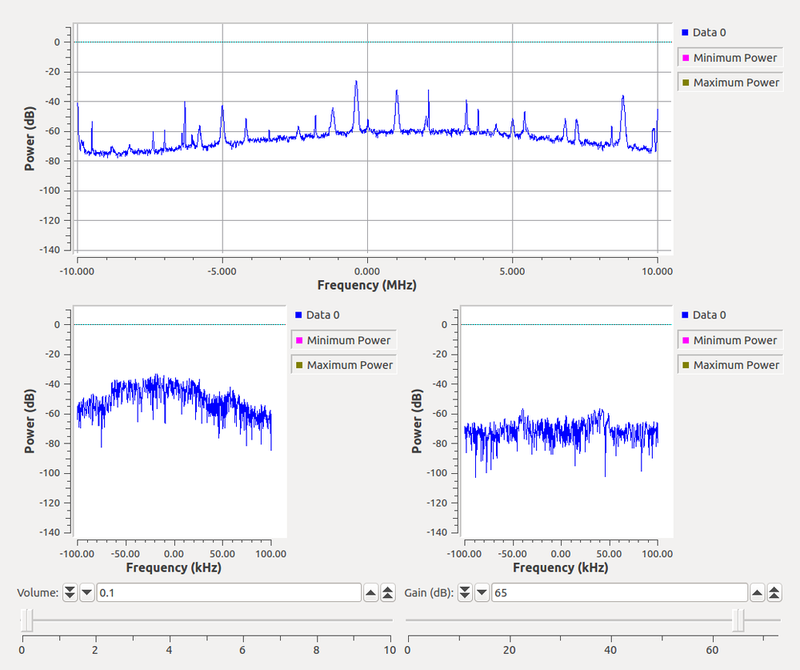 The frequency domain plot has a few of its own interfaces to work with. First, you can set the min and max holds and reset them as you want to. The Average box tells the GUI to average a certain number of plots, which can help smooth out noise. Also, there are a few lines drawn on this display, including a line (green) showing the value of the maximum signal in the current display as well as a line (cyan) of the average noise. The waterfall plot also has a few things to play with. As I already mentioned, you can auto scale the intensity bar range, or you can manually adjust using the two wheels. The top wheel sets the upper bound of the intensity plot while the bottom wheel sets the lower bound. Furthermore, you can change the color scheme with the "Intensity Display" drop-down box, which includes a "User Defined" selection that lets the user set the upper and lower colors for the plots and then interpolates between them. One final note about the plots is that each of the figures allows you to position the cursor anywhere in the plot and it will tell you the current values. By left-clicking with the mouse and dragging a box, you can zoom in to any region, too. You can zoom in about 10 times. A right-click will back up a single zoom step. So that's the basics of how to incorporate a QT gui into a flow graph and how to use the figures. 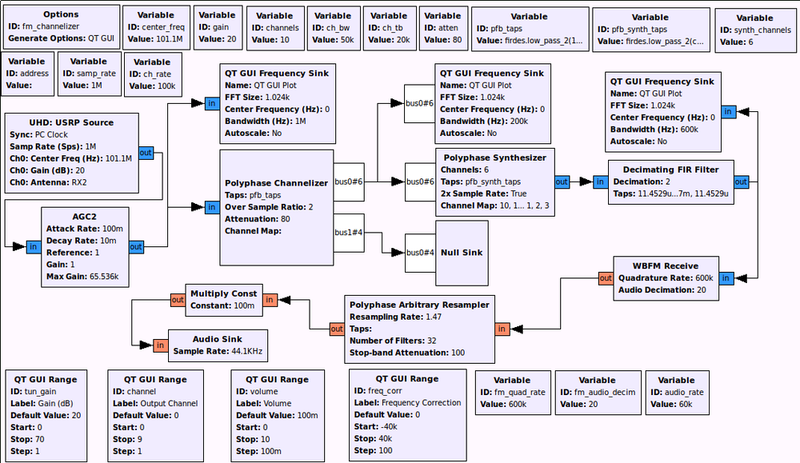 This example shows the basics of how to use a filter in GNU Radio. First, we have to generate a set of filter taps, which can be a vector of either real complex values. While you are welcome to generate the taps any way you would like, GNU Radio provides a few generating functions to make this easier. The first example shows the use of the "firdes" utility, which is used to generate windowed FIR filters. Here, I am creating a simple low pass filter (LPF). There are generally two versions of each type of filter. Those with the "_2" extension provide a means of specifying the out-of-band (or stopband) attenuation (in dB). Generally, you want to use this version as it costs you almost nothing but gives you an extra parameter to control. We are specifying, in order, the filter gain, sample rate, center of the transition band, the transition band width, and the stopband attenuation (in dB). The center of the transition band specifies the point where the rolloff is 6 dB down from the passband. This value and the transition band are set relative to the sample rate. Since the sample rate here is set to 1.0, we must also specify normalized bandwidths. We can also use a real sample rate here and scale the widths appropriately in terms of Hz. The filter_basics.py example shows the use of two filters: filter.fir_filter_ccc and filter.fft_filter_ccc. These take the same arguments and both filter a signal with the same filter taps. The difference is in how they do it. 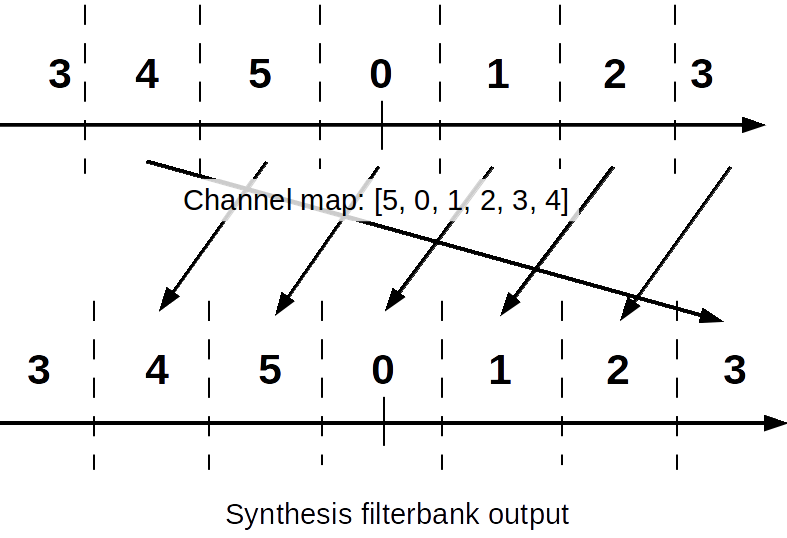 The version with "fir_" performs a straight-forward implementation of an FIR filter by performing the convolution in time. The "fft_" version, however, performs the fast-convolution, which means that it takes an FFT and performs the convolution as a multiplication in the frequency domain. 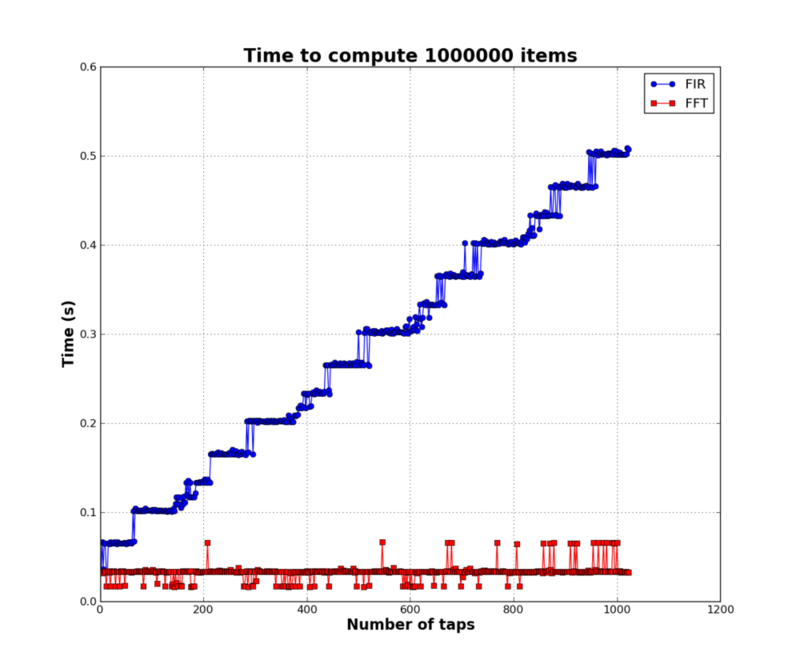 The results are then passed through an IFFT to get the samples back into the time domain. For small filters, which is somewhere around 30-taps and fewer, the FIR filter version performs faster. However, the fast-convolution takes advantage of faster multiplies and the inexpensive FFT and IFFT operations. For larger filters (greater than 30), these operations perform better than the FIR filter. 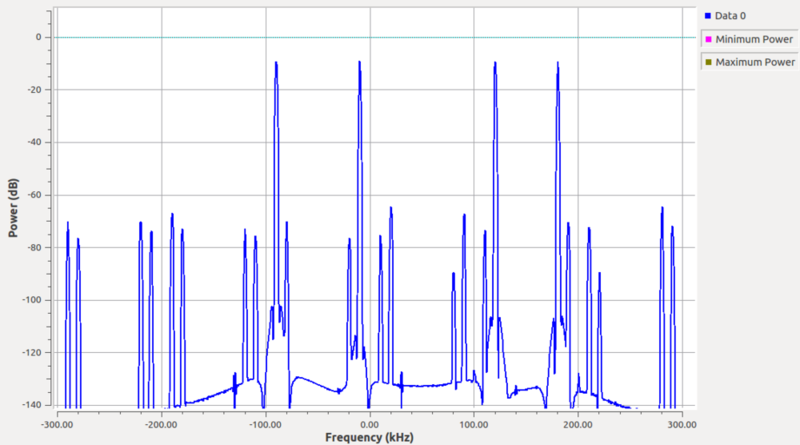 The figure below shows the output of filtering a noise signal with both an FIR and FFT version of the same filter. While this does not show off the difference in speed, it shows that the output is the same. In time, they look almost identical. In the frequency domain, we can see a slight difference due to numerical precision that is negligable. To compare the processing time of the different filers, you can use the filter_timing.py file. It takes a few minutes to run as is. The variables N, start, stop, and step can be easily changed to examine different aspects of the behavior. Looking at the times for 1024 taps (sampled every 2 taps) produces the following image. This was on an Intel i7-2620M CPU with AVX enabled in VOLK. The FIR filter climbs nearly linearly, though the step-wise pattern is likely related to something in the VOLK vectorized processing. However, the FFT filter is nearly flat over all filter sizes. It also shows that on this processor, the crossover point is a very small number of taps; in fact, it's close to 1. The second example shows the use of a second GNU Radio filter design utility called "optfir" module, also a part of the "filter" module. However, the optfir module is built entirely in Python while firdes is written in C++. This filter designer uses the Parks-McClellen algorithm for designing filters. Unlike the firdes windowed filters, this utility gives you another degree of freedom when designing filters: the passband ripple (in dB). You have to watch out for this utility, though, especially if you are comfortable with using firdes. In the firdes utility, you specify the center of the transition band, which is 0.5 in linear amplitude or -6 dB in log power scale. You also specify the transition band, which is the width from the cutoff to the stopband. On the other hand, in the optfir utility, you will specify the end of the passband(s) and start of the stopband(s) (plural if you are designing bandpass filters). 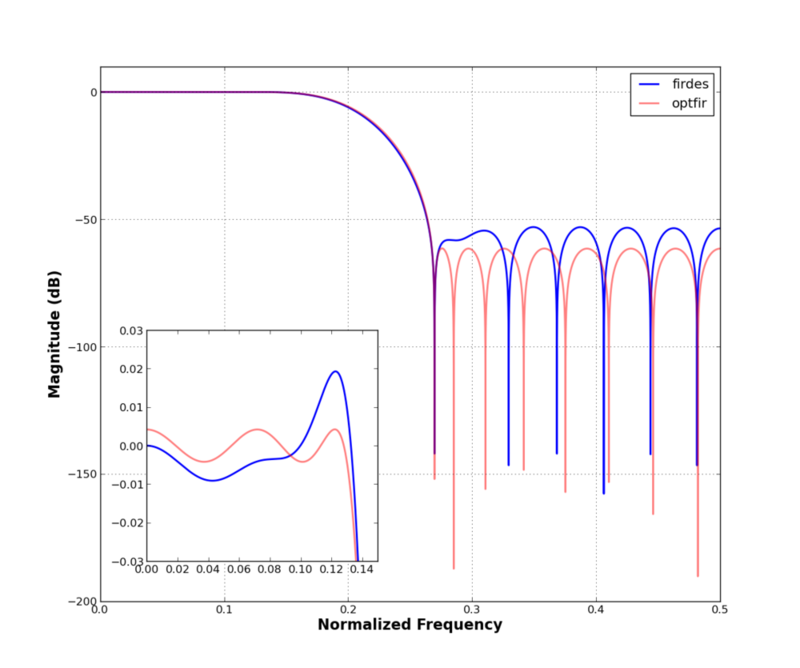 The end of the passband is the point when the filter roll-off begins, not the 3-dB or 6-dB point, and the start of the stopband is where the first null occurs. Keep in mind, though, that these values are going to be approximate since the Parks-McClellen algorithm is an optimization technique that attempts to fit a filter to the desired specs. In the following example, I tried to design a LPF with both the firdes and optfir filters that were approximately the same filter, by which I mean having the same passband and stopband. What is different is that the specified passband ripple from optfir gives me a much lower ripple for the same number of filter taps (27 in this case). 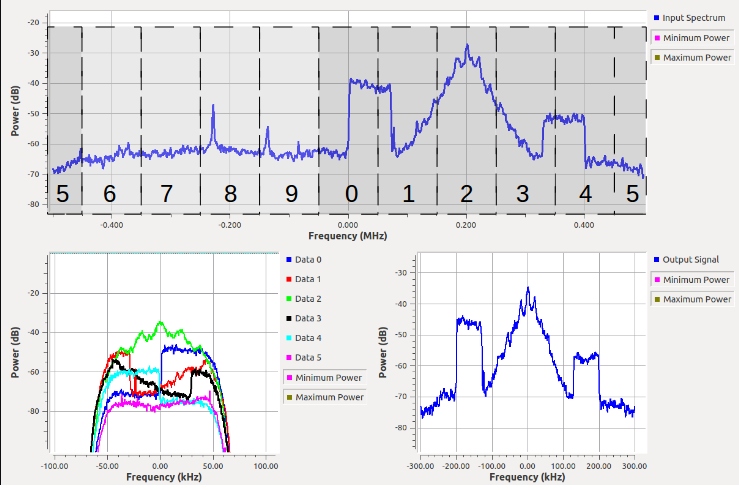 If we specified a ripple of, say 0.03 dB, we can reduce the filter size a bit farther. The point here being that for approximately equivalent filters, you are generally going to get a smaller filter using the Parks-McClellen. We create the taps with the following function calls. I just wanted to get a simple application programmed up and available for people to see the basics of GNU Radio. In this equivalent of a "hello world," I'm simply creating a couple of signal sources and outputting them to a vector sink. To display the results, I'm using the Python package Matplotlib, which can be easily installed in almost any operating system. 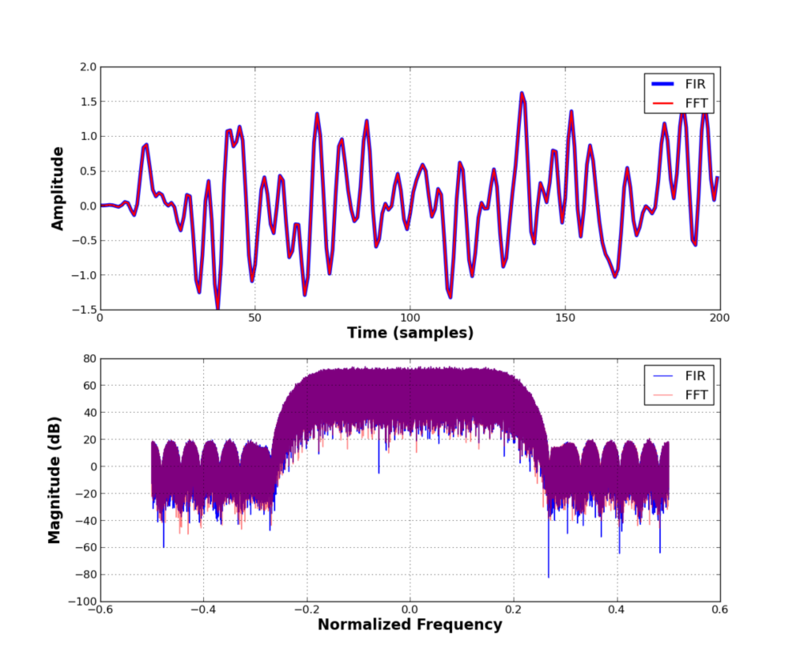 The output is displayed below showing the resulting signal in both time and frequency.